The Cisco Aironet 1250 Series is a component of the Cisco Unified Wireless Network, which can scale up to 18,000 access points with full Layer 3 mobility across central or remote locations on the enterprise campus, in branch offices, and at remote sites. The Cisco Unified Wireless Network is the industry’s most flexible, resilient, and scalable architecture, delivering secure access to mobility services and applications and offering the lowest total cost of ownership and investment protection by integrating seamlessly with the existing wired network. There are several general questions to help you figure out what Cisco Aironet 1250 Series Access Point is. Q: What is the Cisco Aironet 1250 Series Access Point? A: The Cisco Aironet 1250 Series Access Point is the first enterprise-class access point to support the IEEE 802.11n draft 2.0 standard. With its modular design, the Cisco Aironet 1250 Series Access Point supports current and future wireless technologies, ensuring investment protection. With both 2.4-GHz and 5-GHz 802.11n draft 2.0 standard radio modules, the access point delivers total data rates of up to 600 Mbps, meeting the performance requirements of the most demanding applications. Integrated MIMO technology provides more reliable coverage and greater throughput for both existing 802.11a/b/g clients and new 802.11n clients in even the most challenging wireless environments. Users can now rely on wireless networks to give them a similar experience to wired networks, providing them with mobile access to high-bandwidth data, voice, and video applications regardless of their location. Q: How does the Cisco Aironet 1250 Series Access Point fit in the Cisco WLAN product portfolio? A: The Cisco Aironet 1250 Series Access Point Series is a critical component of the Cisco Unified Wireless Network solution and can be deployed in either standalone (autonomous) or unified (light weight) mode. The full breadth of Cisco unified wireless features and mobility services is only available when deployed in lightweight mode with a wireless LAN controller, and the Cisco Wireless Control System (WCS) management solution. The unified feature set represents the most comprehensive set of capabilities in the industry, including guest access, wireless intrusion detection and intrusion prevention, voice-ready services, scalable Layer 3 mobility, and location services. When configured with LWAPP, the Cisco Aironet 1250 Series can automatically detect the best-available Cisco Wireless LAN Controller and download appropriate policies and configuration information with no manual intervention. Access points deployed in standalone mode have a subset of capabilities suitable for basic enterprise deployments. Access points deployed in standalone mode may later be upgraded in the field to lightweight mode, thereby providing customers a smooth path to benefit from the complete set of unified features. Q: What are the major benefits of the Cisco Aironet 1250 Series? RF Leadership: The Aironet 1250 Series is the industry’s first enterprise draft 11n AP. The Aironet 1250 Series supports physical layer (PHY) data rates up to 300 Mbps per radio, a greater than five-fold increase over the performance of 802.11a/g networks. Integrated MIMO technology improves coverage, reduces dead spots, and augments overall client throughput. Integrated RF management capabilities increase system capacity, improve system performance, perform automated self-healing to compensate for RF dead zones and access point failures, and provide a comprehensive way to manage spectrum. Combined, these capabilities enhance reliability and throughput to provide a better overall end-user experience for users relying on the wireless network for business functions. Investment protection: The Cisco Aironet 1250 Series is a powerful, modular and upgradeable platform that provides support for the IEEE 802.11n draft 2.0 standard today. Platform modularity ensures a smooth migration path to emerging higher-performance wireless technologies and future advanced services. Extensive Interoperability: The Aironet 1250 Series Access Point has undergone extensive interoperability testing to ensure simple, secure interoperability with other 802.11 devices. It is the first Wi-Fi CERTIFIED 802.11n draft 2.0 access point, has earned the Intel Connect with Centrino certification, and has undergone extensive testing in 802.11n plug fests. ●Standards-based authentication and encryption including support for 802.11i, Wi-Fi Protected Access (WPA), WPA2, and numerous Extensible Authentication Protocol (EAP) types. These certifications support IEEE 802.1X for user-based authentication, Temporal Key Integrity Protocol (TKIP) for WPA encryption, and Advanced Encryption Standard (AES) for WPA2 encryption. ●Integration with the Cisco Secure Wireless solution, providing the industry’s first integrated wired and wireless security solution. Management and deployment flexibility: The Cisco Aironet Series access points are key components of the Cisco Unified Wireless Network, a comprehensive solution that delivers an integrated, end-to-end wired and wireless network. Using the radio and network management features of the Cisco Unified Wireless Network for simplified deployment, the access points extend the security, scalability, reliability, ease of deployment, and manageability available in wired networks to the wireless LAN. Q: What are the key similarities between the Cisco Aironet 1250 Series and the Cisco Aironet 1240AG Series? A: Both series are designed for challenging RF environments such as factories, warehouses, and large retail establishments that require the antenna versatility associated with connectorized antennas, a rugged metal enclosure, and a broad operating temperature range. Q: What are the key differences between the Cisco Aironet 1250 Series and the Cisco Aironet 1240AG Series? A: The Cisco Aironet 1250 Series is the only Cisco access point designed to support the IEEE 802.11n draft 2.0 standard. It supports 10/100/1000 Ethernet and was specifically engineered to support the power, throughput, and mechanical requirements of MIMO and 802.11n. The Cisco Aironet 1250 Series is a modular, dual-band access point with a choice of 2.4-GHz and 5-GHz IEEE 802.11n draft 2.0 radio modules. The platform modularity ensures a smooth migration path to emerging higher-performance wireless technologies, including the final 802.11n standard. The Cisco Aironet 1240AG Series is a fixed-configuration access point and the 802.11a/b/g radios cannot be upgraded. The Cisco 1250 Series has 32 MB of flash memory and 64 MB of DRAM, while the Cisco Aironet 1240AG Series has 16 MB of flash memory and 32 MB of DRAM. Q: Will the Cisco Aironet 1240AG Series become obsolete due to the introduction of the Cisco Aironet 1250 Series? A: No. The Cisco 1240 Series provides a lower-cost rugged indoor 802.11a/b/g alternative for customers who do not require an access point that supports the IEEE 802.11n draft 2.0 standard. Q: What are the powering options for the Cisco Aironet 1250 Series? Is the Cisco Aironet 1250 Series 802.3af-compliant? A: The Cisco Aironet 1250 Series Access Point may be powered by a Cisco Ethernet switch, a power injector, or a local power supply. The Aironet 1250 Series Access Point with one RM1252 radio module installed requires 12.95W, which is within the 802.3af Power over Ethernet standard. Any Cisco switch supporting 802.3af may be used to power the Aironet 1250 Series Access Point with one RM1252 radio module installed. Beginning late 2007, Cisco will enable auto-negotiating, single-port power for the Aironet 1250 Series access point on leading switches across the Catalyst portfolio. This unique, integrated solution provides the full power requirements for dual radio modules and eliminates the need to run an additional cabling drop or insert a separate power injector. The Cisco Aironet 1250 Series Access Point may also be powered remotely using a Cisco Aironet Power Injector (AIR-PWRINJ4) or locally using a power supply (AIR-PWR-SPLY1). Q: Can the Cisco Aironet 1250 Series be powered using both the DC input (that is, external AC power supply) and PoE? If both are used, do they load share? Or is it one or the other? A: The Cisco Aironet 1250 Series Access Point can be powered by either PoE or the DC input. If the Cisco Aironet 1250 Series Access Point powers up over PoE (using either an 802.3af or a high-power injector), then that is the power source. If the Cisco Aironet 1250 Series is plugged into a DC power source, the access point resets and the unit is run from the DC jack and does not go through 802.3af discovery so the Ethernet port will not have power. Q: Will third-party Power over Ethernet mid-span devices be able to consistently power the Cisco Aironet 1250 Series? A: No interoperability testing has been done with third-party Power over Ethernet mid-span devices. 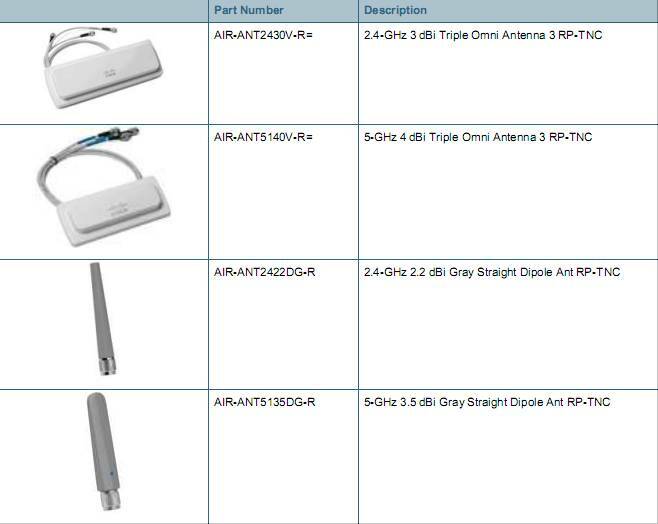 Q: What antenna options are available for the Cisco Aironet 1250 Series? 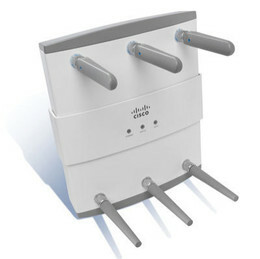 A: Several new antennas were specifically designed for the Cisco Aironet 1250 Series. To support the 2.4-GHz and 5-GHz IEEE 802.11n draft 2.0 radio modules with MIMO technology, new 2.4-GHz and 5-GHz ceiling omnidirectional antennas were developed. Each enclosure contains three antenna elements in a single white flush mount enclosure, providing an aesthetically pleasing option for installation in drop-ceiling office environments. Also available are new 2.4-GHz and 5-GHz straight dipole antennas in gray to match the accent colors of the Cisco Aironet 1250 Series access point. Table 1 contains a list of the new antennas being introduced with the Cisco Aironet 1250 Series. Note that Cisco Aironet 1250 Series access points are certified for operation only with Cisco Aironet antennas; to ensure regulatory compliance, select Cisco Aironet antennas for use with Cisco 1250 Series Access Points. Q: Will the articulating dipole antennas work with the Cisco Aironet 1250 Series? A: Yes. These antennas are also supported for operation with the Access Point 1250 series. Q: Is the Cisco Aironet 1250 Series UL 2043 plenum rated? A: Yes. UL 2043 is a standard specified by Underwriters Laboratories. In the United States, most municipal building codes require certain UL certifications for equipment used in buildings. Municipalities often specify UL 2043 certification for equipment used in the plenum air spaces. Municipalities also define what they consider to be plenum air space. In some U.S. municipalities, the plenum air space includes only the area above a suspended ceiling. In others, the area below the suspended ceiling may also be considered the plenum area. Q: What client devices are compatible with the Cisco Aironet 1250 Series? A: The Cisco Aironet 1250 Series is interoperable with any 802.11n draft 2.0, 802.11a, 802.11b, or 802.11g Wi-Fi-certified clients. Cisco has also conducted extensive testing to ensure interoperability with enterprise-class 802.11n draft 2.0 clients from leading manufacturers such as Intel and other major silicon vendors. Cisco has also completed Intel’s Connect with Centrino compatibility testing program to help ensure high performance and complete interoperability between our respective next-generation 802.11n draft 2.0 solutions. In addition, Cisco clients and third-party Cisco Compatible Extensions (CCX) clients enjoy the enhanced wireless security and mobility capabilities provided by the Cisco Unified Wireless Network solution. Q: Will the Cisco Aironet 1250 Series support the Cisco Unified Wireless IP Phone 7921? A: Yes. The Cisco Unified Wireless IP Phone 7921 is Wi-Fi-compliant and will interoperate with any Wi-Fi-compliant access point, including the Cisco Aironet 1250 Series. The 802.11n standard ensures backwards compatibility for 802.11a/b/g devices. Q: What is the coverage model of the Aironet 1250 Series with 802.11n draft 2.0 radio modules compared to existing IEEE 802.11a/b/g access points? A: If you plan to replace your existing IEEE 802.11a/b/g access points with the AP1250, you can simply replace them one for one and experience enhanced wireless performance. Q: Will my current WLAN controllers support the Cisco Aironet 1250 Series and 802.11n ? Q: What considerations do I need to take into account when designing my controller infrastructure? A: With a wide range of WLAN controllers to choose from, flexible controller deployment options, and ‘n+1’ controller scalability, Cisco’s Unified Wireless Network is designed to support both a gradual migration to 802.11n as well as an immediate large scale 802.11n deployment. This scale-as-you-grow flexibility is an ideal solution for customers looking for a flexible, customized solution for their pervasive wireless deployments. As customers migrate from 802.11a/b/g deployment to 802.11n, no major redesign or re-architecture is needed for most customer deployments. Q: Does the Cisco Aironet 1250 Series support bridging and backhaul functions, in addition to its access point function? A: Yes. When operating in the standalone (autonomous) mode, the Cisco Aironet 1250 Series supports link role flexibility, providing both access point and bridge functions through configuration of each radio as an access point, repeater, root bridge, non-root bridge, or workgroup bridge (Table 2). This array of configuration flexibility enables the Cisco Aironet 1250 Series to address applications including basic wireless LAN coverage, wireless LAN coverage with wireless backhaul, and more traditional bridging applications. Q: Does the Aironet 1250 Series support dynamic frequency selection (DFS) to provide access to the channels in the UNII-2 and UNII-2 Extended bands? A: Yes. The Cisco Aironet 1250 Series supports a very robust DFS algorithm, enabling the effective use of the UNII-2 and UNII-2 Extended bands in the United States, Europe, and other countries around the world. This is especially important for 802.11n deployments, where the additional channels can be leveraged to support a greater number of 40-MHz wide channels. Q: Will the Cisco Aironet 1250 Series IEEE 802.11n draft 2.0 radio modules support 40-MHz channel widths in both the 2.4-GHz and 5-GHz bands? A: Yes. Although 40-MHz channel widths are supported in the 2.4 GHz band, Cisco does not recommend using it because of the restricted amount of available spectrum; only one non-overlapping 40-MHz channel can be supported by the entire band. The 5-GHz band is much better suited to the use of 40-MHz channel widths. Q: Which 802.11n packet aggregation modes will the Cisco Aironet 1250 Series IEEE 802.11n draft 2.0 radio modules support? A: The Cisco Aironet 1250 Series IEEE 802.11n draft 2.0 radio modules support both A-MPDU and A-MSDU packet aggregation modes. These modes are supported for both transmit and receive functions. Q: Will the Cisco Aironet 1250 Series IEEE 802.11n draft 2.0 radio modules support 802.11n legacy beam forming? A: Yes. The Cisco Aironet 1250 Series IEEE 802.11n draft 2.0 radio module hardware supports legacy beam forming. Legacy beam forming uses an Open Loop mechanism to determine the coefficients necessary for forming a beam in the direction of the client. This feature will be enabled in a future software release. Q: What accessories are available for the Cisco Aironet 1250 Series? Q: What is the warranty for the Cisco Aironet 1250 Series Access Points? Q: What is the procedure for upgrading radios in the Cisco Aironet 1250 Series Access Points once future technologies become available? A: The Cisco Aironet 1250 Series was designed as a modular and upgradable access point platform. When new radio modules become available, the old radio module may easily be removed and replaced in the field. Q: What is IEEE 802.11n? A: IEEE 802.11n is a new wireless standard designed to deliver an approximate five-fold increase over 802.11a/g network performance. 802.11n uses MIMO technology to increase the reliability and predictability of the wireless network by optimizing the effects of multipath propagation. The standard allows operation in both the 2.4-GHz and 5-GHz frequencies, and is backward-compatible with existing 802.11a/b/g networks. The Wi-Fi Alliance has begun certification of 802.11n products adhering to the draft 2.0 standard. This certification will ensure interoperability between access points and devices. Q: What is the status of the Draft 802.11n version 2.0 standard? A: The IEEE 802.11n working group has passed letter ballot, and this is what is known as 802.11 Draft 2.0. Subsequently, the Wi-Fi Alliance commenced compatibility testing in June 2007 to ensure interoperability of products adhering to the 802.11n draft 2.0 standard. The Cisco Aironet 1250 Series Access Point was selected as the reference platform for the Wi-Fi Alliance test bed. All products receiving Wi-Fi Alliance draft 2.0 certification must be tested with the Cisco Aironet 1250 Series Access Point. Further information can be found here Error! Q: What is the status of the final 802.11n standard? A: The final standard is expected to be ratified in Sep 2008 but this date may change as the working group continues its work. The current IEEE timeline for 802.11n ratification may be found at https://grouper.ieee.org/groups/802/11/Reports/802.11_Timelines.htm. Q: When will the final 802.11n solution from Cisco be available? A: Cisco works closely with and monitors all relevant IEEE standards, including 802.11n. Shortly after 802.11n ratification occurs, Cisco plans to deliver solutions that are compliant with the final 802.11n standard. Q: Will Cisco guarantee that the Cisco Aironet 1250 Series can be upgraded to support the final 802.11n standard? A: Cisco cannot guarantee that the current Cisco Aironet 1250 IEEE 802.11n draft 2.0 standard radio modules can be software-upgraded to support the final 802.11n standard. However, the modularity of the Cisco Aironet 1250 helps ensure that should the final 802.11n standard require a hardware modification, the impact will be limited to just the radio modules, and will not require a change to the access point. The Cisco Aironet 1250 Series radio modules are field-upgradeable and easy to change. Q: What is multiple-input multiple-output (MIMO) technology? A: Multiple-input multiple-output (MIMO) technology uses advanced signal processing with multiple antennas to improve the throughput, reliability and predictability of the wireless LAN. By operating with multiple transmitters and receivers, MIMO-based access points can take advantage of the effects of multipath propagation to decrease packet retries and improve the fidelity of the wireless network. The benefits of MIMO technology extend to 802.11a/b/g clients in the form of improved reliability and predictability of the network. More consistent throughput and improved reliability will provide a better overall end-user experience for high-bandwidth data, voice, and video applications. Q: How is it possible to increase the typical throughput for 802.11a/b/g and 802.11n clients with MIMO, when the data rates for the clients are fixed by the 802.11 standard? A: Access points and clients equipped with MIMO smart antenna technology are able to receive signals more reliably over greater distances than those with standard diversity antennas. This means that 802.11 data rates extend further from the access point using MIMO than with a standard diversity access point. For example, a client operating at a specific distance from an access point with standard diversity may be experiencing data rates of 36 Mbps, as compared to sustaining 54 Mbps when connecting to an access point with MIMO. Q: What about my investment in 802.11a/b/g? A: 802.11a and 802.11g each offer a 54-Mbps data rate, supporting a broad range of applications, including voice and video. With the relative under-utilization of these frequencies, especially the 5-GHz band, and the large installed base of 802.11a/b/g clients, most enterprises should anticipate their investments in business-class 802.11a/b/g access points to have many years of service. Additionally, the 802.11n standard requires backward compatibility with existing 802.11a/b/g infrastructure. Cisco expects 802.11a/b/g and 802.11n technologies to coexist for a long time. Q: Do Distributed Antenna Systems (DAS) work with 802.11n? A: MIMO technology relies extensively on multiple transmitters and multiple receivers to attain the throughput, reliability, and predictability benefits of 802.11n. The current generation of DAS systems only support a single transmit/receive chain per access point. Therefore, the throughput, reliability, and predictability benefits of 802.11n will be lost when used in conjunction with a DAS. Q: What are the differences in performance between a 2×3 and a 3×3 MIMO implementation? A: Theoretical calculations show that a 3×3 radio will have slightly better performance over a 2×3 radio. However, in our real world performance testing we have not seen any significant performance differences between 2×3 and 3×3 implementations. Note that the current generation of both 2×3 and 3×3 802.11n silicon supports up to 2 spatial streams, so there is no throughput advantage for a 3×3 implementation.